I can playfully imagine Lyautey Unit Blocks, recently purchased by The Met, fitting in scale somewhere between the smaller size of Carolyn Pratt’s plain wood Unit Blocks designed around 1913 for the City and Country School in NYC and Marshall Herbert Lyautey’s large urban development programs in Morocco. This is simply a scale comparison and does not consider the important political questions raised by Barrada in her installation. Lyautey developed these ideas with architect Henri Prost from 1912-1925 as experimental models for the modern 20th century in France and in the French colonies. 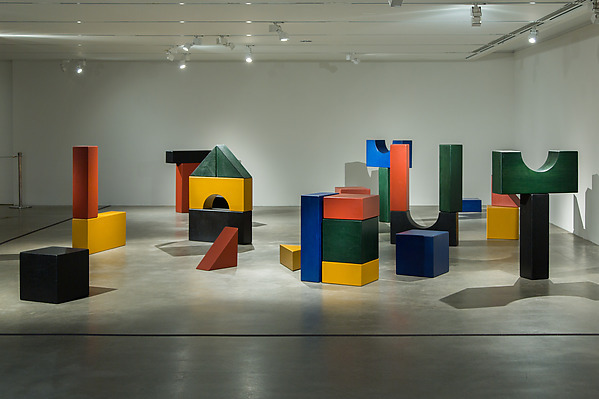 Curiously, Carolyn Pratt was also interested in the design of urban life and the creative ways that children used her Unit Blocks to reconstruct their ideas of their local city neighborhood.